Hellooo errbody! Usually I would do Mainstream Mondays today, but I figured I'll do something different! Today will be the start of Textured Polish Week! Textured polishes have been a thing for sometime now, and I've got a bunch in my stash, so I thought I'd dedicate a whole week to them! Anyway, I'm starting off TPW with two polishes from the O.P.I Mariah Carey Collection. First, I present to you, Get Your Number. Get Your Number is a medium blue jelly base with tiny and small holographic glitters. It dries to a matte, slightly gritty, textured finish. Opaque in two coats, but I did three thin coats because I felt like two wasn't saturated enough. Of course, no top coat for this swatch. I had a hard time capturing the bottle shot because it was so sparkly! And here we have Stay the Night. 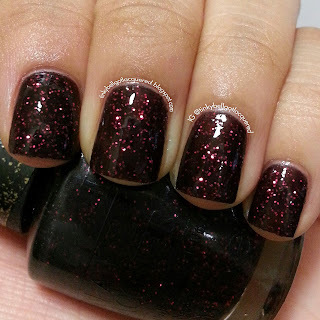 Stay the Night is a black jelly base with small hot pink glitters. It dries to a matte, slightly gritty, textured finish. Again, opaque in two coats, but I did three because it wasn't saturated enough for my liking at two. Again, no top coat for this swatch. My camera got all crazy when I tried to take the bottle shot for this one! But wait! Of course I had to try it with a top coat! Look at that sparkle! Isn't it pretty? The base also looks darker with the top coat. It looks like pebbles under a fountain, doesn't it? Whoa. I love this one more with top coat! 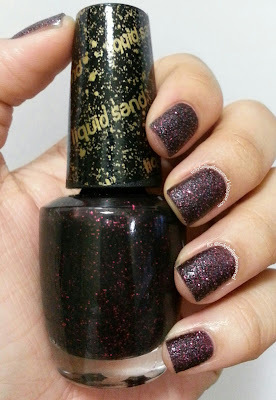 Again, the base looks darker and the glitters pop more with the top coat. Thoughts? Textured polishes aren't for everyone, but I sorta like it! I can't stop feeling my nails... Haha. The texture is like, well, sand... I cannot accurately describe how it really feels, so I suggest you try it yourself. :) However, some people find textured polishes to be a bit much, and there is the possibility of it snagging on clothes, hair, etc. but I don't think it's that gritty to be caught on things. If you really don't like the texture, you can always slap some top coat on it and it should be good. The formula on these polishes were a bit thin, but you do need thin coats for the texture to develop better while drying. It was actually easy to work with! Would I recommend these polishes? I think so! I know some people don't like textured polishes, but I think you should give them a chance. The colors are pretty, and you can always put top coat on if the texture really bothers you. But they do look good on their own, so I do hope you give these polishes a chance. Plus, they come in a set of mini bottles so if you're not too sold on the idea yet, you wouldn't have to feel so bad about purchasing full-sized bottles when you end up not liking it.